2D racing game played from a top-down perspective. Remarkably, it was released for the Sega Dreamcast over 10 years after its North American launch date. 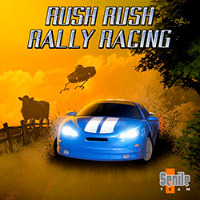 Rush Rush Rally Racing is a top-down racer that can be played with up to 4 players. Grand Prix - A 10 level race. Time Attack (Wiiware Only) - Race against a ghost car to beat your best time. Challenge (Wiiware Only) - A single-player version of the Get Ahead mode with a computer-controlled opponent. Get Ahead (2 Player) - Players must race far ahead enough so that the runner-up disappears from the screen. First to do this 5 times wins. Versus (2-4 Players) - A standard race. You can choose from the 10 Grand Prix stages plus new multiplayer only stages. Item (2-4 Players) - The same as Versus mode but now includes Mario-Kart style powerups that can help or hurt you in a race. The Dreamcast release of Rush Rush Rally Racing included a deluxe edition that came with a soundtrack CD and stickers. There's another version that included an alternate nighttime cover art. Senile Team announced that a Wiiware version was in development. The game was released in the European Wii Shop on April 19, 2012 for 900 Wii points (9 euros). No US release has been announced yet.